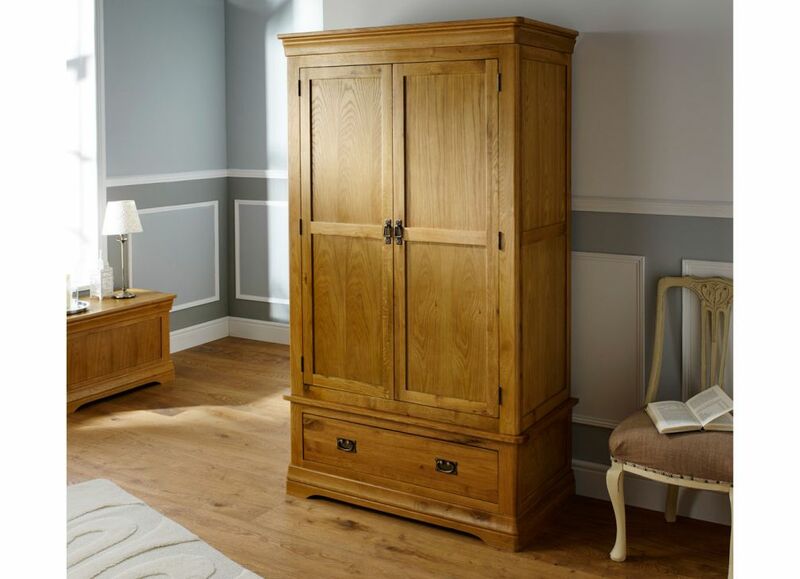 The French Farmhouse double oak wardrobe design is made from American oak that combines really well with the French Farmhouse detailing and styling that give it the real wow factor to transform a bedroom. Handmade exclusively for Top Furniture with the rounded edge detailing on the upper and lower corners. 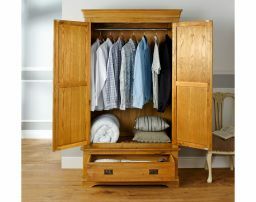 You get a huge amount of storage space behind the two oak door panels to hang your clothes on an internal rail. 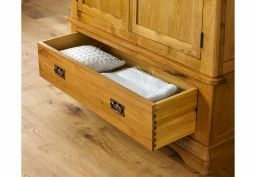 The lower drawer unit offers additional storage space and is backed up by classic doevetail joints which is an illustration of the quality of this item. 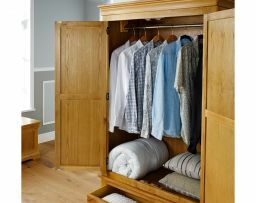 Please note that this wardrobe requires some self assembly to the larger top section which has now been added as an optional paid service on the checkout page for most postcodes. The lower drawer unit comes fully assembled in its own box but the larger top section would be too large for us to deliver into most homes if it came pre assembled within a box. This item comes in a hard wearing oiled wax finish which also matches with our very popular Country Oak range of tables and chairs. Larger size available to view in our Uttoxeter, Staffordshire warehouse showroom. Amazing quality. Looks better than photo. Very pleased, definitely order again from here. Thank you. Or and friendly delivery service. Fantastic solid quality. Beautifully crafted. Nice wardrobe, looks good and has plenty of room. Easy to assemble. So easy to put together and it looks amazing, lovely style and finish. We bought the bedside tables and the two over three chest of drawers. Very pleased with all four pieces and found the staff at the Dartford showroom extremely helpful. Would definitely use again. 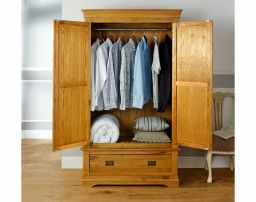 The wardrobe was part of an order for a complete bedroom. The service was brilliant, it arrived on time, the delivery guys were very helpful and the protective packaging was the best I have seen. Everything was in perfect condition and competitively priced. Would not hesitate to recommend the company. Very sturdy and well built. Easy to assemble. 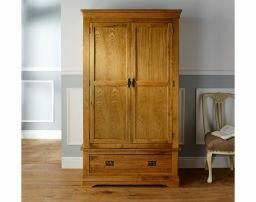 Comparable to other oak furniture retailers but a better price. Very sturdy, attractive and well-built. Easy to assemble, looks and feels like good quality furniture that will last.